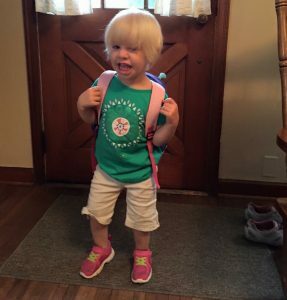 I’ve had quite a few people ask me lately how Sophie is doing at preschool, if she will go to kindergarten on time, if she will attend a regular school, etc, so I thought an update on her progress might be helpful to those who love Sophie and pray for her faithfully. We so appreciate each of you and we never underestimate the power that your prayers have had and continue to have in Sophie’s life. When Sophie began the school year in fall of 2015, about 9 months ago, she was just beginning to make some sounds and say very simple words (ma, up, go, ice, bye). She used many, many signs, and so we had some indication that she understood quite a bit, but we were unsure before she began to verbalize where exactly her cognitive abilities lie. As the year has unfolded and her verbal skills have progressed, we have been delighted in discovering the wealth of knowledge that was trapped inside her head. We discovered that Sophie can count to 20. We learned that Sophie can recognize almost all of the letters of the alphabet, most of the time, in any order presented. We found that Sophie knows every animal, even the weird ones, and all the noises that they make. We thought before but had confirmed for us that she knew all of her colors and shapes, as well. Most recently, in constructing Teacher Appreciation cards and Mother’s Day cards, we have learned that Sophie knows how to spell her name and can write it with hand-over-hand assistance. Sophie knows a lot of songs, though she cannot truly sing them yet. So, having just turned four years old, Sophie has met some of her kindergarten benchmarks already! She has another year of preschool to complete before she would even be eligible for kindergarten, so I have little doubt in my mind that she will be ready to go when she’s five (although we will still have the option to do an additional year of preschool if we want to give her more time). I can hardly conceive of it. A year ago she was not speaking at all. In just 8 months, she went from the simplest of words to speaking in short sentences. It is truly astounding! In addition, at a mid-year developmental assessment, Sophie scored just below average for her age range, rather than being categorized as developmentally delayed, which she has been since four months of age. We are overjoyed to have finally shed that label and are continuing to work towards developmentally average and beyond! 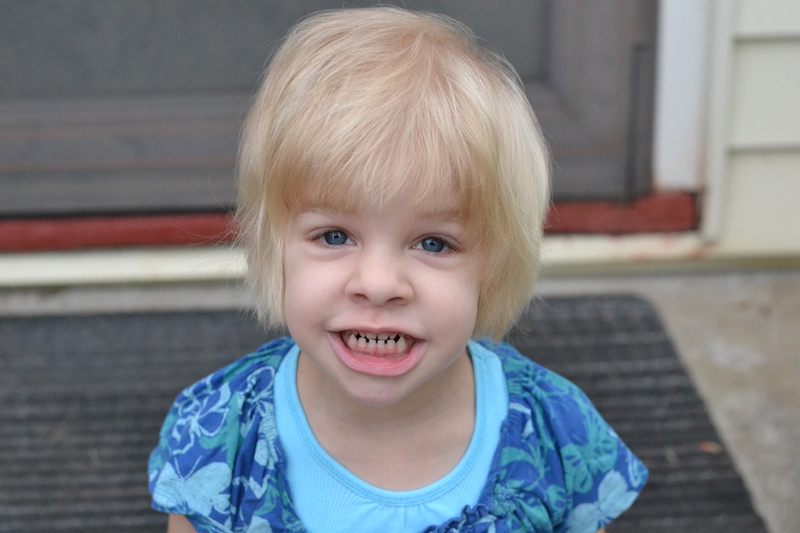 Sophie will still require speech therapy for quite some time yet. Her apraxia is still at play in the extra difficulty that she has in formulating certain sounds which she should be able to form and in using the correct sound in the correct place. She’s got tons of sounds now, but her mind struggles to plan the right sound at the right time, which means that her speech is often difficult to understand. Our current goal with speech therapy is to increase her precision with vowel sounds so that she is more intelligible to those she speaks with. We probably understand about 80-90% of what she says. I imagine that outsiders would probably get about 25-30%. Sophie spent three and a half of her four years and three months in silence, so it’s not at all odd to me that she is still learning about what to say when or how to act in certain social settings. She’s making a lot of progress there, beginning to learn what to say when, and I hope that as her speech improves and she learns social cues for speech, her social awareness will increase. In spite of her social differences, Sophie experienced beautiful acceptance a classroom full of sweet friends and two BFFs (pictured: Evelyn & Collins) on top of that. God truly blessed Sophie with caring friends and nurturing teachers. Even another child in her class who routinely struggled with behavioral issues consistently showed compassion to Sophie. Her teacher told me at our spring conference that Sophie was by far the most popular child in her class! This is totally amazing to me! Not because I don’t find Sophie wonderful, but because as adults, we are so focused on interacting with those who have something to give us in return. 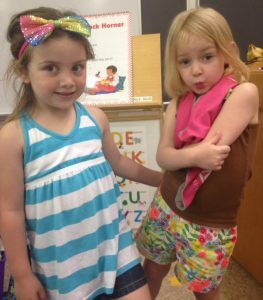 Seeing Sophie interact with her friends at preschool reminds me that friendship is not about what I can get out of it or what someone else can give me. It’s just about giving to others that you enjoy being with. On the medical front, Sophie’s genetic testing for Weidmann-Steiner Syndrome has just been completed. Her test revealed that particular gene was normal! I was overjoyed to hear these results! So many happy tears! Thank you, Jesus! We return to the geneticist in July to see what our next steps may be. This test was run on just one gene, so choosing another gene to look at is, as you may imagine, like looking for a needle in a haystack. We may be at a dead end for now, which is totally fine because Sophie is doing so well. We don’t NEED to find an answer because she’s not deteriorating or failing to progress. So that’s very GOOD. It’s likely that somewhere in one of her many genes there is a minor deletion, duplication, or sequencing error, but this occurs in many individuals. It would account for the differences we have experienced thus far in Sophie’s development, but it may not be a named syndrome, and we may never know which particular portion of a certain gene is affected. As long as she’s doing well, it’s really NOT a big deal to know the specific gene and if it is a named syndrome. As I reflect on this school year, I’m simply overwhelmed by how much progress Sophie has made. Every small step feels miraculous and wonderful! I am so thankful that in a year full of other kinds of difficulty for myself personally, God has encouraged my heart so much through Sophie’s progress. He has been faithful time and again. I know that he is enabling her awesome progress and blessing her with favor in addition. He has been so very good to our sweet Sophie girl! And I know he will continue to be. To think that when she was four months old, we had to question if she would live to see four years old… Now here we are with a developmentally “slightly below average” chatter box, romping around, loving life. So very good. Thanks, God.